Energy is a vital substance required throughout the world to maintain human civilization and to advance modern technologies. A significant portion of our energy demand comes from hydrocarbon, like oil and gas. Mathematical and computational methods describing multi-phase, multi-component fluid flow in porous media play an important role in developing and managing these resources. Numerical solutions of these nonlinearly coupled partial differential equations pose new challenges in mathematics, petroleum engineering, as well as computer sciences. A primary challenge in reservoir simulation is the accurate description of multiphase flow in porous, heterogeneous, and fractured media with complex geometries. In addition, over recent years, reservoir models have been growing in complexity, for example, including geomechanicial, thermal, and chemical effects. The lack of robust and efficient nonlinear and linear solvers for fully implicit formulations is still one of the major bottle-necks in today’s reservoir simulators. 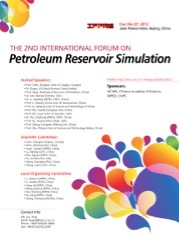 This conference will gather petroleum engineers, mathematicians, and experts in related fields to address emerging challenges in mathematical modeling of compressible multi-phase flows in porous media, fractured media, complex wells, coupled numerical solution of porous media and geomechanics. We will also discuss several aspects of numerical schemes, including, but not restricted to, unstructured grid generation, new discretization methods, linear and nonlinear solvers, parallel computing, hybrid computing involving multicore CPUs and GPUs, real field studies for oil and gas reservoirs using simulators.